As advised by Sri Seshadri Swamigal, Sri Sachidananda Swamigal started his divine mission by proceeding to Vallimalai, the birth place of Valli Nayaki, who had dedicated her entire life to the worship of Lord Muruga and became His consort. 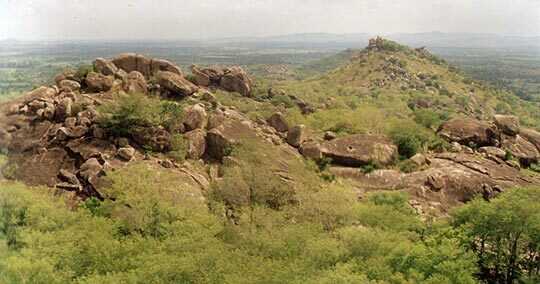 This place, known as the Parvatha Rajan Hills, was surrounded by forest where peacocks flocked in plenty. 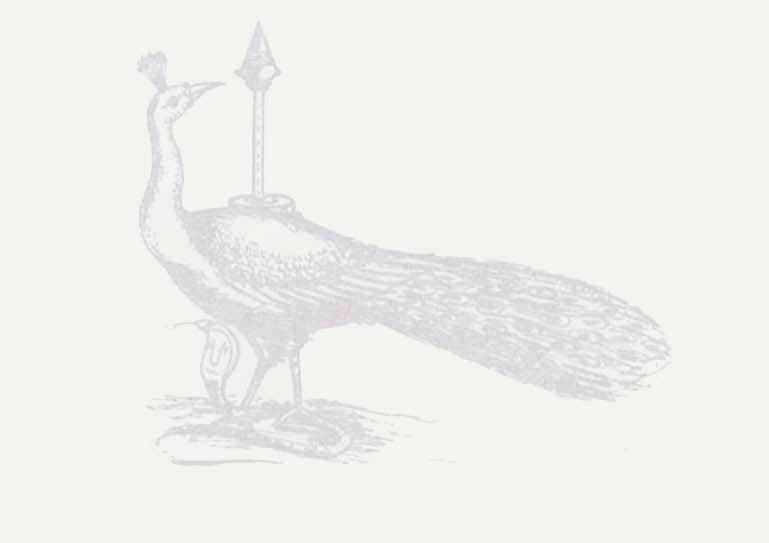 According to Swamigal, the peacocks were crying “gu-ha, gu-ha”, as if they were calling their Lord Guha by name. Many sages have done contemplation and penance from the caves of this mountain for years. Such a place sanctified by the presence of Valli proved to be an ideal ground for Sri Sachidananda Swamigal to spread the message of Thiruppugazh. 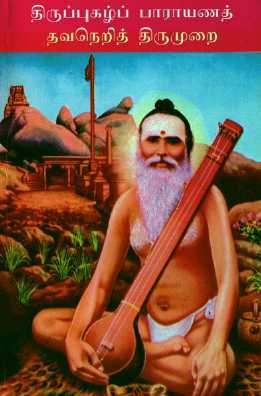 Having mastered Thiruppugazh as a philosophy, Swamigal also gave musical expression to it. He devised different tunes for different songs. He rose beyond all barriers of caste and creed and made a clarion call to all devotees to adopt Thiruppugazh as a way of life. Swamigal spotted a small tribal girl of seven years, taught her Thiruppugazh and named her as Valli. The girl who owned a rich and sonorous voice was soon transformed into an excellent Thiruppugazh singer. Swamigal observed the spark of devotion in a blind destitute boy of eleven years, named him as Kannappan, after the Saivite saint who plucked his eyes to donate to Lord Siva. Swamigal then imparted Thiruppugazh training to him. It was a wholesome training and the student came out with flying colours both in the knowledge of reciting it and practicing it. One evening, when Kannappan was heading towards Swamigal’s residence, he lost his way in darkness. Soon, there appeared someone with a light and conducted him till he reached Swamigal’s place. Soon Kannappan became well known as Kannappa Bhagavathar. While rendering discourses, Swamigal used to render Tiruvakuppu, Vel Vakuppu, Devendra Sangu Vakuppu with great involvement and explain the meaning and importance of these songs. He stated that the composition of these songs is so marvelous and divine that the author Arunagirinathar could have done it only by the grace of Muruga. He used to play a rare musical instrument with four strings, called jativadyam, invented by himself. Swamigal made it his life’s mission to spread the glory of Thiruppugazh to all corners and if Thiruppugazh is considered today as a synonym of Muruga worship, it is mainly due to the dedication and devotion shown by Swamigal in highlighting its importance. 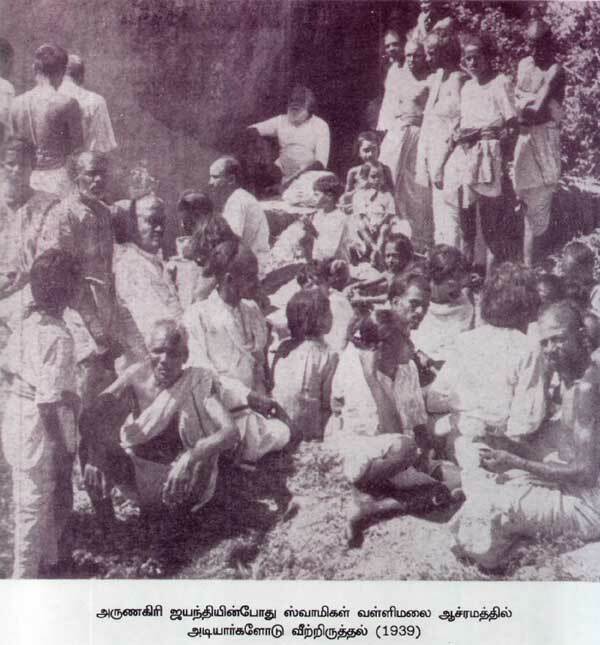 Initially, Swamigal did not remain within the confines of Vallimalai. He was always on the move visiting Tiruttani, Tiruchendur, Tiruverakam and other temples in Tamil Nadu and conducting Thiruppugazh recitals. One of his favourite stop-overs at Chennai was 292, Lingi Chetti Street, Madras, where resided his friend Sri Chengalvarayan and his brother Shanmugam. Once, when Swamigal was stepping into this house, known as the “Mother House of Thiruppugazh” (Thiruppugazh Thai Veedu), he found a guest already there. Soon Shanmugham introduced the guest, T.K. Lancashire, ICS, District Judge to Swamigal. Having come to know Swamigal’s knowledge, the British national cited a quotation:“Peace hath her victories no less renowned than war.” He then queried whether there is any Tamil poem with similar idea. Soon, Swamigal quoted a passage from Tirukkural which conveyed the same idea (Pakai Natpak Kondozhugum Panpudaiyalan Thakamai Kan Thangitrulaku”). 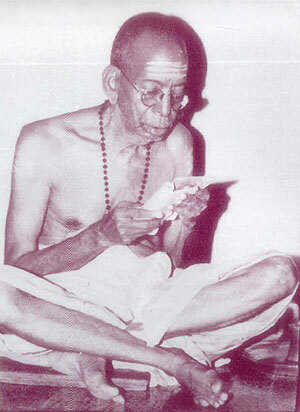 A notable saint who moved very closely with Swamigal was Swami Anvananda. It is believed that Valli herself appeared in the vision of Swami Anvananda and asked him to construct a temple for her and accordingly Swami constructed the temple at Madras in the year 1954 which has come to be known as Sri Vaishnavi temple. Sri Sachidananda Swamigal received immense help from Sri Chengalvarayan in his mission of highlighting the glory of Thiruppugazh. 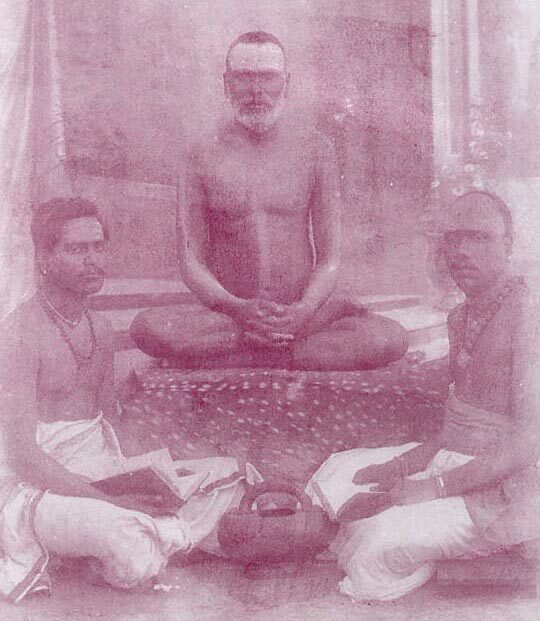 Sri Sachidananda Swamigal has devised a proper method of conducting Thiruppugazh recitals which he called Thiruppugazh Parayana Thavaneri Thirumurai. He also published a book by this title,explaining it as the ideal way for liberation (moksha). He also authored various other books titled: “Mei Kaval”, “AnushtanaThiruppugazh", Markazhi Parayana Thirumurai, etc. Occasionally, Swamigal also visited the houses of devotees to enquire their welfare. Thiruppugazh being a musical form of worship, Swamigal established bhajan sabhas at different centers. These sabhas turned out to be excellent platforms for aspiring students to learn Thiruppugazh. 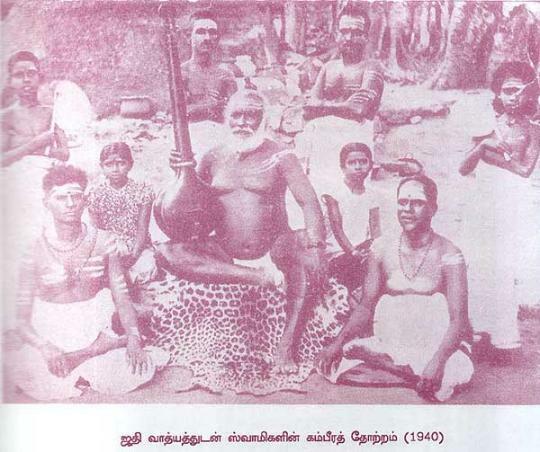 Swamigal’s initiatives helped to groom many Thiruppugazh singers. There were over 150 students learning Thiruppugazh from Swamigal at one particular time. Pleased with the way Sri Vallimalai Swamigal took up the cause of Thiruppugazh and projected its greatness, Sri Seshadri Swamigal conferred siddhi (power) to him. This is evident from the incident when Swamigal conferred blessing to a newly born child of Shanmugam at Chennai and almost simultaneously, according to certain eye witnesses, Swamigal was conducting classes at Vallimalai.